Just got confirmation that we’re appearing on Kevin Slaymaker’s radio show Between Two Worlds tonight (ie. Monday, 8-10pm). Might even be the opening track, so tune in on time. (There doesn’t seem to be any option that allows you to listen later). You can listen online here. Between Two Worlds 83 is a little over 24 hours away and you`ll be able to hear music from 11 countries that spans 4 decades. The UK, the US, Greece, Holland, Sweden, Wales, Ireland, Iran, China, France and Romania are all featured. It all starts at 8pm UK time on Monday 30th April at www.crmk.co.uk. Hope you can drop by to hear Jonesy, Halo, Atomic Rooster, Knight Area, Also Eden, Coralspin, Steve Khan, Opeth, Wang Wen, 12band, Fruupp, Man, Phoenix, Echo, Eye 2 Eye and Aphrodites Child but not necessarily in that order!!. Honey and Lava is currently being sent out to reviewers. If you’re a reviewer and would like a copy, and suspect that you’re not on our list, then please get in touch with the name of your magazine/fanzine/website and your name and address by e-mailing coralspinfo@coralspin.com. Had a few CD purchases already from some good men,. The sort of men you’d like to have beside you in the trenches. God bless you lads. Anyway, the shop system seems to be working (thank you brave volunteers, TBH we were a bit worried about the risk of radiation poisoning associated with some of the mind-control technologies we’ve downloaded as a widget). So the rest of you can now start clicking on the ‘Add to Cart’ buttons, without any worries at all about any of that Helvetica-heading-format-fungal-infection nonsense that some Willie-McBride-wannabees have been touting around the internet (for goodness sake, McBride was eventually struck off, wasn’t he?). Unless, that is, our intrepid digital pioneers are felled by an agonizing, brain-eating alien parasite that starts devouring them from within. But we’ll let you know if that happens. (Are we going to keep posting this sort of nonsense at a rate of knots? You bet — we’ve been waiting for ages to get going with it). 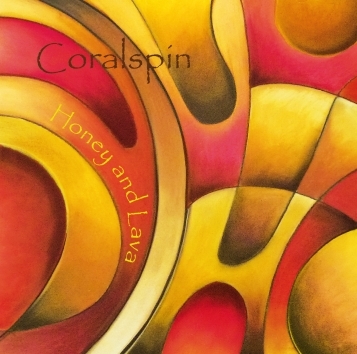 The Honey and Lava album cover was done by the amazing artist Christopher Townsend, and he deserves a big shout-out. His website is here. 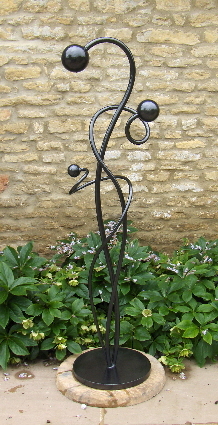 His metal sculptures are incredible too. I’ve bought some, they are beautiful as well as arty, and not at all ugly-East-London-conceptual-art-gallery-your-eyes-hurt-to-look-at-it-rubbish. They are objects you want to look at all day, just like his paintings. Imagine it 50 feet tall! Our debut album Honey and Lava has just been released and is now available in the shop. Go there now and buy a copy. Go on! Get in early! It’s not available anywhere else yet. We’re over the moon about how it sounds and we are extremely proud of it. The CD of our debut album Honey and Lava is at the factory being manufactured right now. The release won’t be far away! This is the front page of the new Coralspin website. The site will be undergoing construction over the next few days.